This is a much closer race than Ford would like to see. Ford’s been trying to prove to the world that, after all, there is replacement for displacement. Vehicles backing this claim up include the new Ford GT with its 647-horsepower V6 engine and the F-150 Raptor’s 450 hp squeezed out of a twin-turbo 3.5-liter V6. Even with a displacement deficiency the V6 had all the power needed to send the old 6.2-liter V8 Raptor to the loser's corner after it tried to mingle with the new kid on the block. This time however, a Ford vs. Ford battle won’t cut it. We, along with the rest of the world, want to see what happens when the Ford goes up against its main rival, a Chevy. 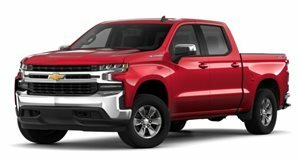 To GM’s detriment, Chevy doesn't make any super powered truck like the Raptor, but a Silverado 1500 fitted with the 6.2-liter V8 shouldn't be scoffed at either, with a Snoop Dogg approved 420 ponies escaping the crank. 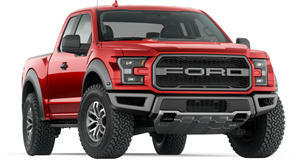 That’s still less than the new Raptor, but it’s more than the old Raptor’s 411 horses that lost the same race last week. Another difference that raises the stakes is that Chevy has a rivalry on the line, and we’re curious to see either A: how badly it loses or, B: if it can hold a candle to the performance of the Raptor. What we find is that the Chevy doesn’t fare too badly. Things take a turn for the best when a surprise competitor comes in to play from Fiat Chrysler. We wish we could say it was the Ram Rebel TRX, but apparently that's a bit too much to ask for given that it's a concept. Regardless, entertainment value is right up there with the Dodge's horsepower figures.